Veil nebula supernova remnant (NGC 6979). This is part of a shell of gas cast off by an exploding star around ten thousand years ago. The expanding gas ring impacts the interstellar medium at high speed, and the shock of this impact ionises the gases, causing them to glow. 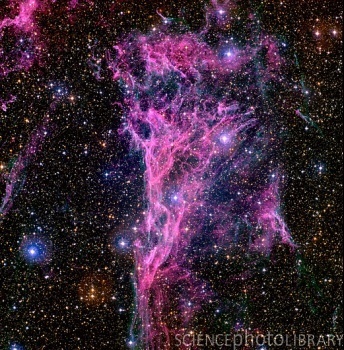 The Veil nebula is only part of the shell, which is called the Cygnus Loop. The entire Loop has a span six times the width of the full Moon. The Loop lies around 1400 light years from Earth in the constellation Cygnus.